I have been thinking about this post for a while, but I have been putting it off because it doesn’t have a real direction. Usually, when I do blog posts, I like to provide the solutions that I have come up with. However, in this case, this post is more of a rant about all the hang ups I have when it comes to money. 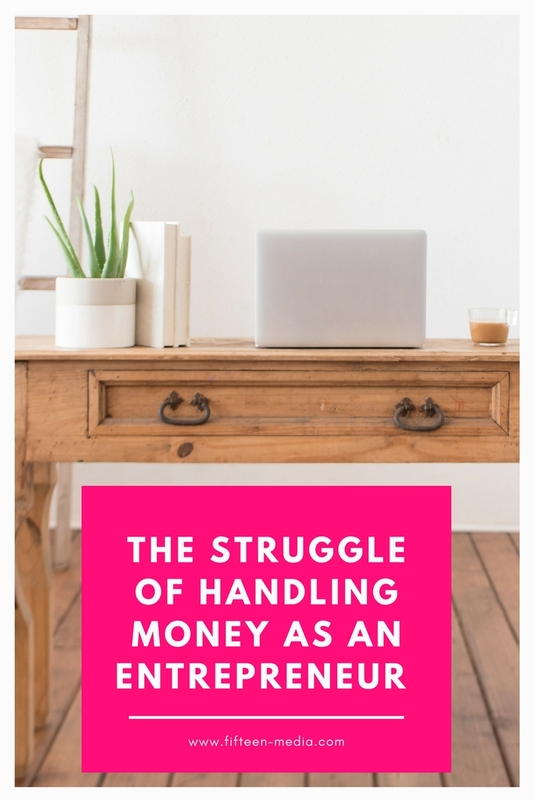 As a small business owner, my income fluctuates each month, which has made it challenging for me to save a certain amount of money. In addition to savings and contributing to my retirement fund, I like to keep a certain amount of money in my business bank account to cover bills and unexpected costs. However, with people paying me at all different times, this can also be a problem. Ultimately, what I am trying to say is--even after doing this for 7+ years--I still don’t have a great system to manage my money properly. It feels like an on-again/off-again relationship that I can’t seem to get out of. Somedays, I feel like we are in a good place: I have put money in savings, paid my retirement, invested in some stocks, and still have cash left over. Other days, I feel like the rug is pulled out from underneath me, and I have to transfer money from my savings or use my credit cards to cover immediate bills. I am always curious about what practices other small business owners have in place. Money causes me shame. This is a very convoluted one because there are many aspects of money that cause me to feel ashamed. If I am having a slower month, I am ashamed that I am not making more. If I am having a great month, I feel guilty that I am making more (yeah, go figure that one out…who knows?!). Shame also comes from the fact that I feel like I am all over the place with money. When I talk to people about it (including my husband), I am always so embarrassed that I don’t have it all figured out, and I have been doing this forever. Why am I always having to transfer money from one account to another to cover immediate bills? Why am I always putting a different amount in my retirement each month? Why can’t I invest a lot each month? Since I am telling you all the things I do wrong, I am going to throw in one thing that I do right. I have been good about always saving 30% of all my checks for taxes, so I mostly never have an issue there. I like to spend. I get a certain high off buying new things. While I don’t buy anything too crazy, frequent trips to Target and Sephora add up very quickly. Not only do I like having new things, I like the experience of shopping. It is a leisurely, fun activity for me, and I love the feeling of finding something I need to have. I am trying to be more aware of my emotional spending habits. If I am having a great day, I need to buy something to celebrate. If I am having a bad day, I need to buy something to make myself feel better. Now that I have realized that I do this, I have stopped myself a few times from making impulse buys. On months where I make more, I feel like that entitles me to spend more on myself because “this is my hard earned money”. For the month of February, I am going to stop thinking this way. I am taking on a big project for the month, so I know it will probably be a good month. Instead of spending more, I am going to give myself a set monthly budget for miscellaneous emotional buys. We will see how it works! Money makes me feel stupid. This is probably the biggest reason that topics send me into a panic attack. An incident that happened last week really spurred me to write this post because I can’t be the only one that feels this way. I was on the phone with my financial advisor (I think that is his title…I don’t even know…see what I mean!!). He was telling me what I should be investing in, etc. By the end of the call, I was basically in tears because I had no idea what he was talking about. It felt like everything he was telling me was in an entirely foreign language. All I could think about for the rest of the day was “Why am I so stupid that I don’t understand this?” As anyone does, I hate feeling this way, so that is always why I just avoid all conversations about money. As with anything else, tackling the fear is the best way to go, so that is what I am working to do. I am asking more questions, researching more and paying more attention to things. I am hoping by this time next year, I won’t be feeling like this anymore!